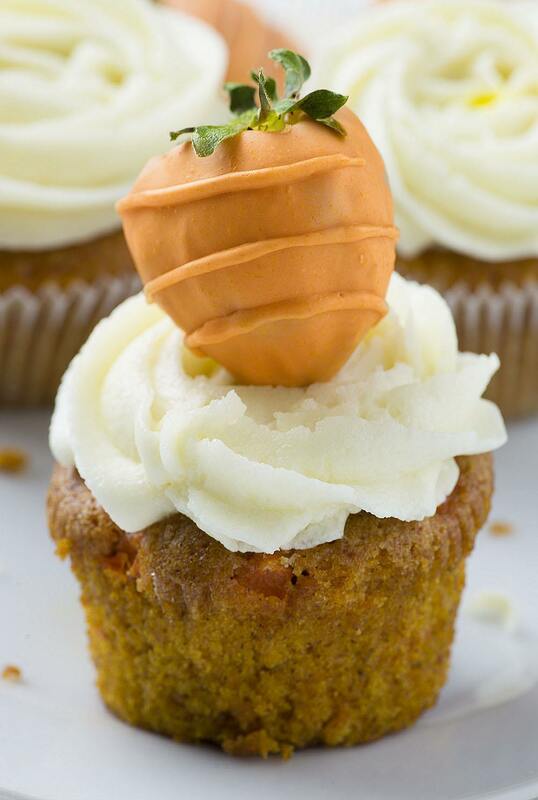 Carrot Cake Cupcakes – absolutely perfect Easter dessert. Easy to make and super moist carrot cupcakes garnished with cute Carrot Chocolate Covered Strawberries laying on top of sweet and tangy cream cheese frosting and shredded coconut. Easy, cute. and perfect for Easter!!! Speaking of Easter, it’s all about cute bunnies, carrots, Easter eggs and baskets…So when it comes to that, I’m like a big kid. Since Santa left the city, I started thinking about The Easter Bunny. As the Santa loves when kids leave him the cookies, Easter Bunny LOVES to find some carrots the night before Easter. Well, I’m pretty sure that the Bunny would not have anything against these cute little strawberries disguised as a carrot. They will get him to comes out of his underground burrow, use magic to grow into a big rabbit to deliver the Easter eggs and baskets. OK, it is time to stop goofing around and get to the point. These Carrot Pecan Cupcakes are the best carrot cake I’ve ever tried. I found this recipe at Garnish and Glaze a year ago, but I haven’t tried it till now. I was looking for the perfect base for my cute carrot chocolate covered strawberries and since Easter is around the corner, I wanted to go with carrot cake base. I was so pleased with the result. 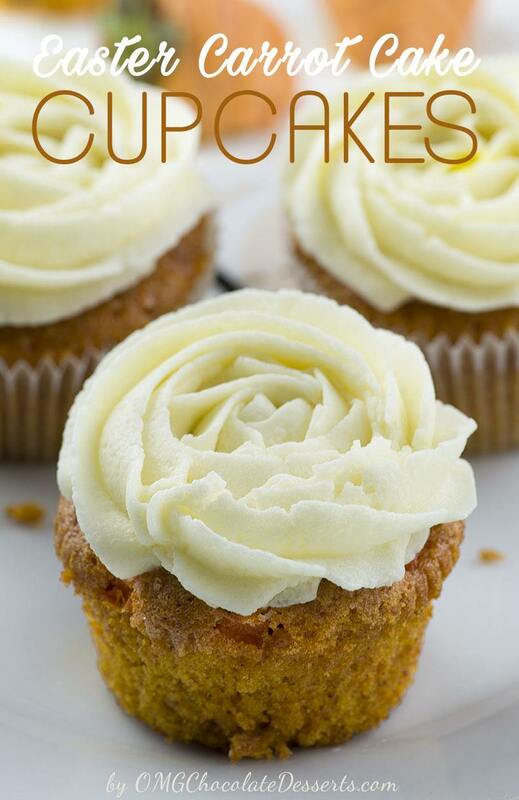 These Carrot Cake Cupcakes are so easy to make. The time consuming part is the grating of the fresh carrots, and the everything else is done in a very short time. And the cupcakes are so goooood! Even unfrosted, these carrot cake cupcakes are perfect for breakfast on the run. The cake part is wonderfully moist and flavorful, thanks to apple sauce I used in the batter, besides the carrots. The original recipe calls for the crushed pineapples, but I haven’t had it on hand so I go with the apple sauce. I’m sure they taste even better with the pineapple but I’ll try it next time. The pecan part was optional in the original recipe, but for me it was must make. It gives extra flavor and perfect balance to the texture. The frosting is also great, smooth as silk. I had some leftovers because I didn’t pipe it so high, but you’ll have enough so you can pipe lovely swirls on the cupcakes if you don’t want to garnish these with strawberries. The only part that gave me a headache about these Carrot Cake Cupcakes was the garnish- Carrot Chocolate Covered Strawberries. My first two attempts were a complete disaster. I tried adding all types of food coloring into melted white chocolate hoping one would work but with no luck. The second I added the food coloring melted chocolate got clump. It was so annoying!!!! So at the end I had to go to the store and pick up a bag of Orange Candy Melts and finally did it right.YAY! Long story short, I finally ended the project successfully. And if you are looking for delicious Easter dessert try these Carrot Cake Cupcakes with Carrot Chocolate Covered Strawberries, they are perfect!!! 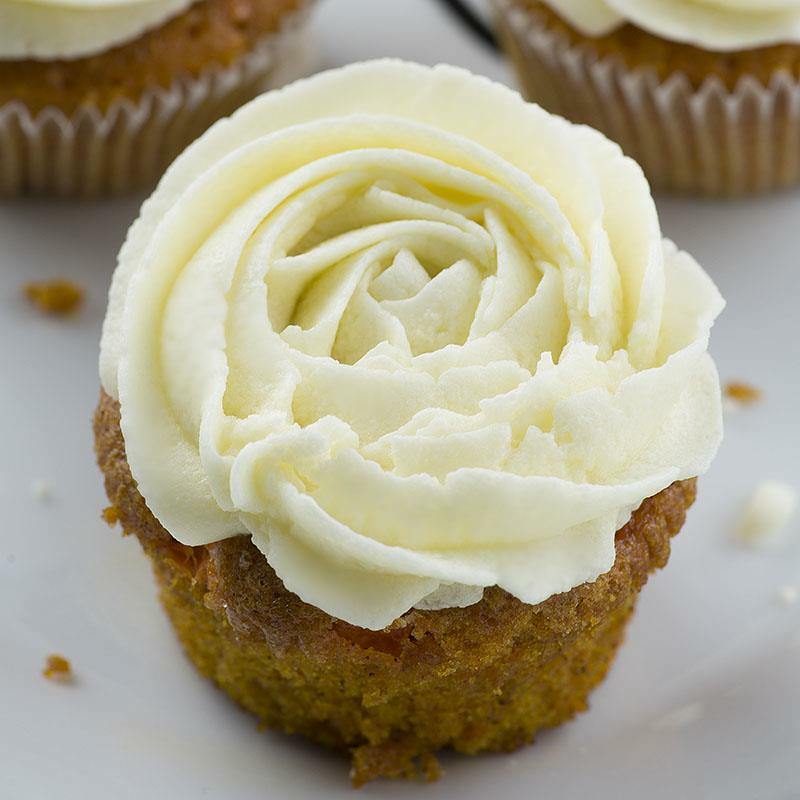 Carrot Cake Cupcakes – absolutely perfect Easter dessert. Easy to make and super moist carrot cupcakes. Melt the candy melts according to the package directions and dip each of the strawberries into the melted candy and place on a sheet of parchment paper to cool and harden. Transfer leftovers of melted coating in a small bag and snipped the corner off then drizzle stripes across the strawberries and let cool and harden. Preheat the oven to 350 F, line cupcake pan with paper liners and set aside. In a large bowl stir together dry ingredients: flour, sugar, baking soda, salt, and cinnamon. Add oil, eggs, apple sauce and vanilla. Mix well. Stir in carrots and chopped pecans until combined. Fill cupcake liners 3/4 full and bake for 15-16 minutes or until toothpick inserted into center comes out clean and be careful not to overbake them, they should be very moist not dry!!! Let the cupcakes cool completely . With an electric mixer cream together butter, sugar, vanilla, and salt until light and fluffy. Add cream cheese 2 ounces at a time and beat as needed. Pipe frosting onto cooled cupcakes and sprinkle with shredded coconut. Store in the fridge. Place the carrot chocolate covered strawberry onto each cupcake before serving. Carrot Chocolate Covered Strawberries adapted from Something Swanky. Carrot Cake Cupcakes recipe adapted from Garnish and Glaze. You could try using the gel-type food coloring. Mix the coloring into a small amount of heavy cream (about a tablespoon or so, depending on the amount of chocolate), then heat with your white chocolate. Stir often. This will make your chocolate a little softer and easier to bite into your strawberry without cracking and flaking the chocolate off your fruit.